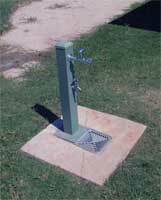 The Parkland Drinking Fountain is an economy priced single pedestal drinking fountain designed for most public places. The unit also includes a side mounted tap to allow filling of containers, or rinsing hands etc. 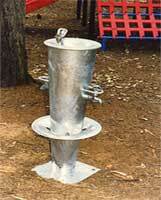 Also available extra drainage options as per park tap post. The unit comes equipped with all fittings ready to connect. 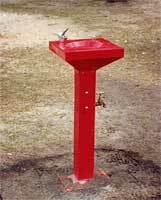 The Galvanished Parktap Post with Doggy Drinker offers respite for not only people in the park looking for a drink of cool water, but also provides a splash pool that cannot overflow to give a welcome drink for Man's Best Friend. A must for any area that permits dog exercise whether on or off-leash. 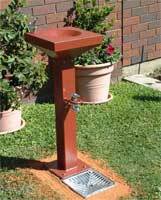 No more unsightly mud puddles around the drink bubbler, this item is designed to carry away excess water from the base into the sub-soil run-off. 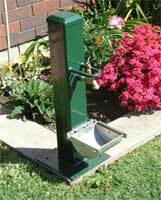 The Bushland Drinking Fountain is a definitive state-of-the-art Council designed drinking fountain having such features as tamper and vandal proof taps and spring loaded drinking tap to reduce water wastage. This item is strongly constructed from rolled and hot dipped galvanised steel plate with stainless steel, and brass fittings, adjustable water flow, pleasing to the eye and made stronger to last longer. Power water inlet and waste water run off from the fountain is via an underground footing, with pipe access directed away from the fountain site.